Oh the dreaded October Lull. The words that no deer hunter wants to hear. The days are getting shorter and the bucks have disappeared from their summer time patterns. Long stand sits with little buck activity are common during the month of October, but have no fear, the rut is near. As a bow hunter I have spent countless hours chasing whitetails and unfortunately many of those hours were spent in the month of October when the bucks just seem to disappear. I would like those to learn from my mistakes over the past hunting seasons so that they aren’t spending your time in the woods frustrated, but rather spent productive. It’s a fact, mature bucks develop patterns that make them harder to kill in October. 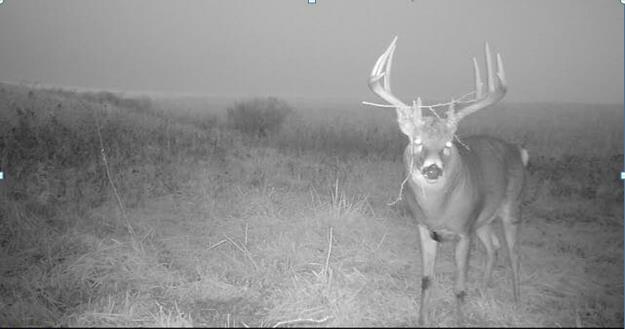 Bucks are moving more at night since the day light hours are dwindling. It is using a few techniques that I will touch base on to provide you a chance in October or set you up for success in November during the rut. In October it is my opinion that the best chance to catch a mature buck slipping up is in the mornings. I was able to arrow a Missouri 10 point in 2013 in the heart of the October Lull by finding a great transition area on the edge of a known buck’s bedding area. I was able to slip in well before daylight and I was in my stand, placing myself between the buck’s food source and his bed. It would just so happen that the buck would bed 40 yards from my tree, standing to stretch his legs a couple hours later, I was able to slip an arrow into his wheel house.I would recommend this technique if you have used earlier scouting to figure out areas where bucks are bedding during the day. Now is not the time to be busting up bedding areas to find mature bucks, but hopefully early season scouting has gotten you to this point. Bucks still have to eat, if you aren’t capturing these bucks on trail cameras, use evening scouting to locate the does on their feeding patterns. Chances are the bucks are around, but waiting for the cover of dark to move. Locate these feeding areas and how the deer are traveling to them, figure out a way to slip in the area during the early morning hours to ambush a buck on the way back to his bed. Halloween. Should I decide to hunt the woods in October I am usually trying to fill the freezer with meat from an old slick head doe. October is also a great time to move trail cameras and revert to on the ground scouting. Don’t start beating the brush up or charging into bedding areas, rather travel the edge of fields and locate rubs and scrape lines as these will be hotspots towards the end of the month. I will quite frequently tear up a tree and make a mock scrape in a mature buck’s range to get under his skin. I will also throw a camera up on that scrape to capture any activity. I was able to capture this buck last October looking angry that I had made a mock scrape in his core range. Mock scrapes will also attract attention from does as well, further increasing your odds during the rut. I never intended this article to deter you from hunting during October but I hope these few tips will make your time in the woods more productive. Stay positive and hunt smart during October if you do venture into the woods. It is a difficult and frustrating time to chase whitetails. Above all, take mental notes or physical notes each and every time you hunt. It will pay off in the long run!